ST. JAMES—Meramec Regional Community Foundation (MRCF) awarded Belle Elementary a $250 grant to purchase coats and shoes for children in need. The check was presented at MRCF’s invite-a-friend luncheon March 12 at MRPC in St. James. This year, the MRCF board reviewed a total of 18 grant applications, requesting a total of $4,414.21 and representing projects in Crawford, Dent, Maries, Osage, Phelps, Pulaski and Washington counties. Belle Elementary was one of six projects selected for funding. Belle Elementary has approximately 290 students’ pre-kindergarten through fourth grades. When a student does not have a coat, the school tries to meet that need. Because of the number of students, sometimes not all needs can be met. 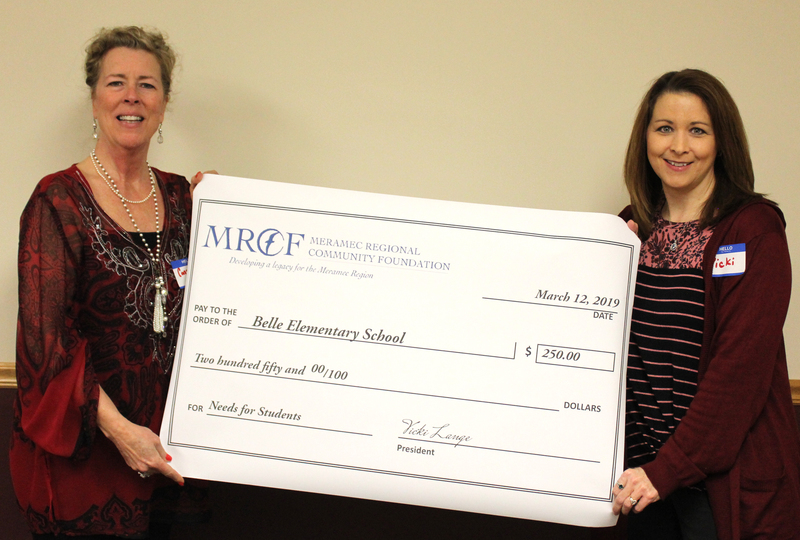 The MRCF Community Grant will go toward making an additional impact on the needs of the Belle Elementary students in the way of coats and shoes. The Bourbon Boosters for ramps to the stage in the park. Cutline: Constance Smith (left), Belle Elementary school counselor, accepts the ‘big’ check and the real check from MRCF Chair Vicki Lange.